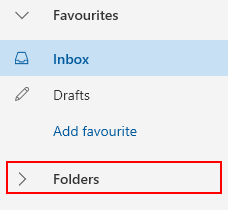 You can create new folders in Outlook.com to organize your messages as you like. For example, you can create a folder for a specific project, for all messages from a particular person, or for all messages sent to a distribution group that you’re a member of. Note: This article is about Outlook.com in a web browser. To get help in the Outlook for iOS or Outlook for Android mobile apps, see Get in-app help for Outlook for iOS and Android. If you can't see your email folders, check that the folders aren't collapsed. Select > Folders to expand the folder list. There is an ongoing issue where some folders might no longer be visible in the Folders list. You can find items saved within the missing folders by using search. We're aware of the issue and are working on a fix. At the bottom of the folder list, select New folder. In the new folder box, enter a name for the folder and press Enter. In the left pane, right-click the folder to which you want to add a subfolder, and select Create new subfolder.